Israeli airlines, Finance Ministry reach a deal; Israel will pay for airlines’ security costs. 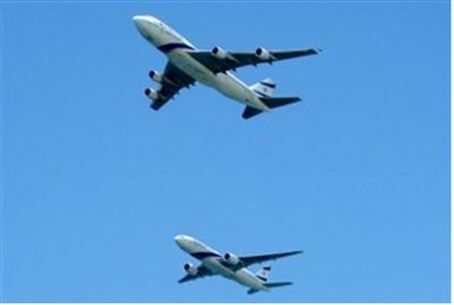 Israeli airlines have ended a strike that began Sunday morning after reaching an agreement with the Finance Ministry. El Al, Israir and Arkia announced the strike due to opposition to the government’s Open Skies agreement with the European Union. The agreement will allow more European airlines to operate direct flights to Israel. The Israeli airlines argued that they would be unable to compete with European providers due to strict government regulations regarding security. Under the agreement reached Monday, the government will cover 98% of Israeli airlines’ security costs. Finance Minister Yair Lapid previously declared that the strike would not change the government’s decision to approve the deal with the EU. “’Open Skies’ are a done deal,” he said. The Foreign Ministry is now looking into ways to assist Israelis who were stranded abroad after their flights home were cancelled or delayed due to the strike. On Monday, Deputy Foreign Minister Zev Elkin instructed consuls abroad to check if there are Israelis in their countries who were affected by the strike.